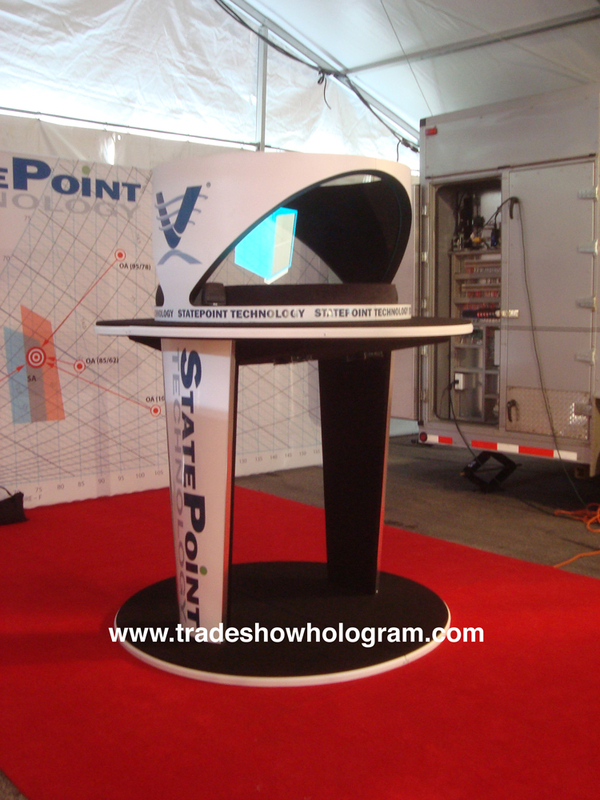 For a decade Trade Show Holograms has been a leader in 3D holographic projection systems across the USA and Canada. 2016 has seen the introduction of two major advancements in the Hologram Projector Industry. 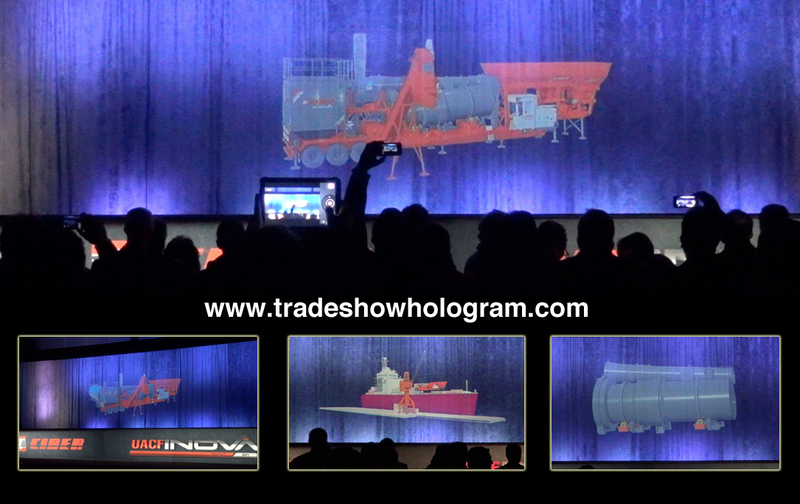 In April the company debuted its new large sized, dual sided interactive hologram projector featuring the new ultra bright projection system at a trade show in Minneapolis MN. In May it announced the introduction of its new line of giant holographic images for theatrical use , press conferences and corporate presentations. 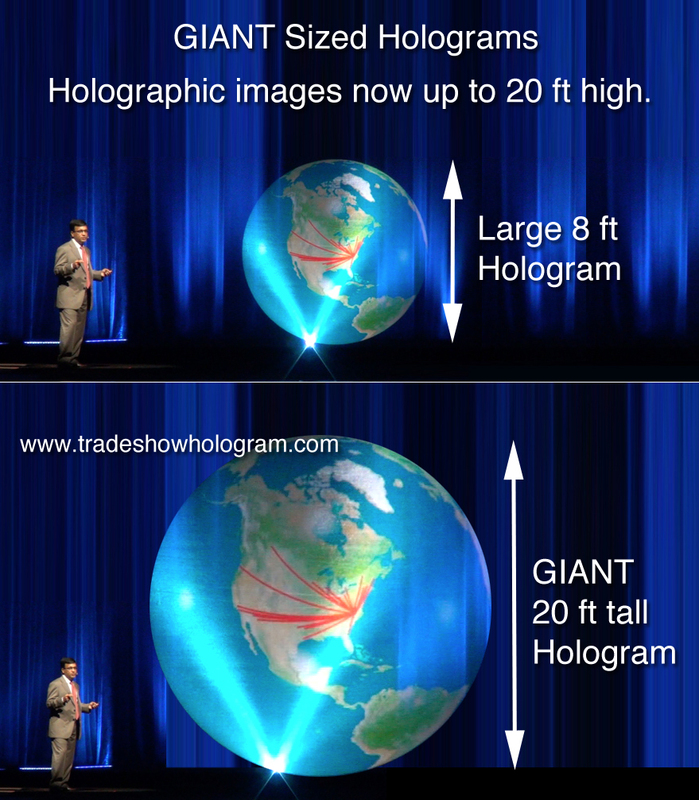 The giant sized holograms now boast a 20 ft tall height from the normal 8 ft tall large scale hologram the company offers. The 3D projection systems allows viewers to see 3D presentations without the use of any special 3D glasses. Holographic images appear to float in mid air. New Projection system creates 3D holographic images up to 20 ft tall. 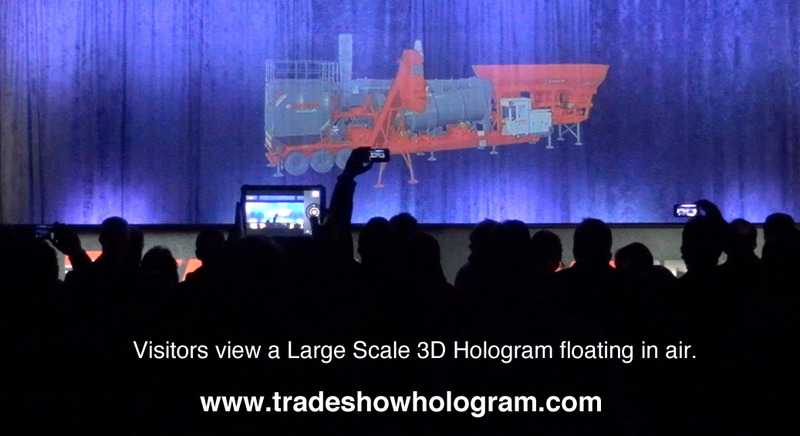 The hologram projector allows people to see a 3D holographic projection ( 3 ft tall, 5 ft wide ,fully animated with sound ) floating in mid air without the need of any 3D glasses. This presentation showed 3 segments of product processing. 3 video monitors in the front of the display showed slide shows of additional equipment but can also play video. The display proved popular and attracted a lot of attention to the booth it was displayed in. 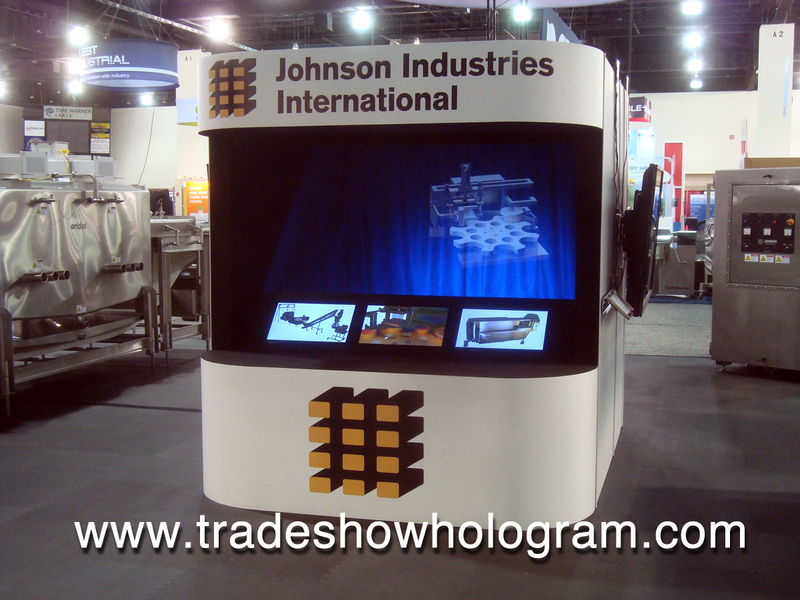 Trade Show Holograms debuted its latest large 3D hologram projector at the International Cheese Technology Expo in Milwaukee Wisconsin on April 22nd, 2014. The holographic presentation was a 5 minute exhibition of the journey of cheese through several production lines. 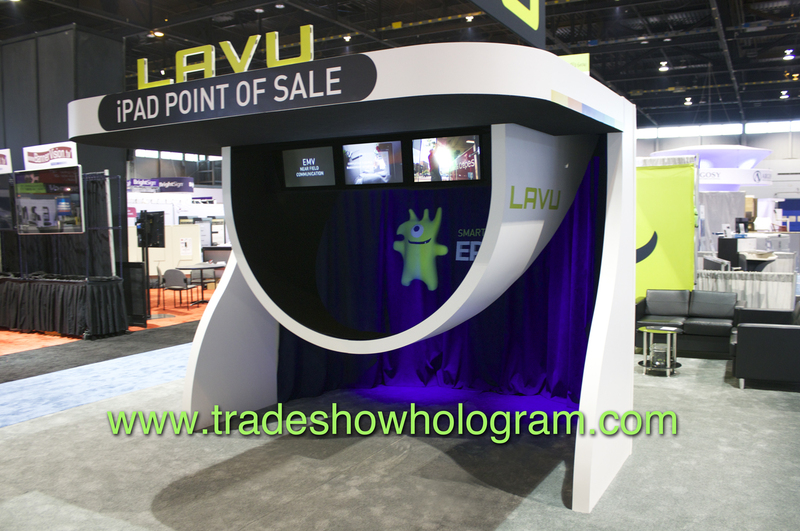 It proved quite popular with trade show attendees and drew crowds into the booth area. 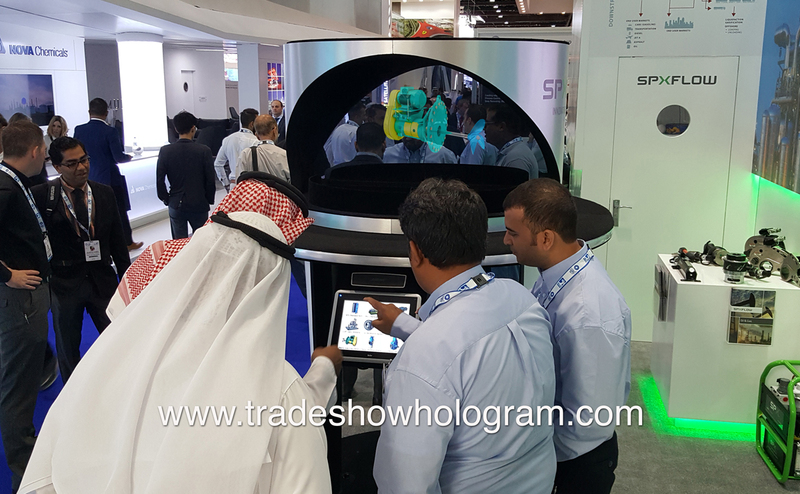 This holographic trade show exhibit is able to show fine detail with extreme close ups of various parts of the process. The hologram image was up to 3 ft high and 5 ft wide to offer viewers better close up detail. This new kiosk features 3 front video monitors which offers an exhibitor the ability to present additional detailed video regarding their product or a photo slide show. The displays are available for both rental and sale in North America. Below is a photo of the display. Video will be available soon on youtube. 3D Hologram Projector displays 5 ft wide images.